Michele Blacks’ interior design studio suddenly felt uncomfortably chilly. Unusual on a warm spring day in Mobile, Alabama. Before she could ponder the odd change in temperature Violet came in. “I’m looking for Ms. Black,” she said, glancing in Michele’s direction. “That’s good to hear. Please, have a seat Ms.…” she gestured to an overstuffed chair in her studio. “It’s Miss Stanfield, Violet Stanfield. Please call me Violet.” She smiled as she sat primly on the edge of the chair. She almost seemed to have the manners and mannerisms of someone of a different era. “Ah, the Stanfield House. I thought your name was familiar,” Michele said. “I prefer my privacy and you haven’t seen what a disaster the inside is,” Violet explained. “Don’t worry about that- better late than never I always say. I could come out later this afternoon to look around and work up a proposal for you,” offered Michele. “No that won’t do at all. I’m quite busy most afternoons and late into the evening. Could you come by in the morning?” asked Violet. As she left, she seemed to take the chill in the air with her. The next day, Michele arrived promptly at 9 at the Stanfield House. Violet was waiting for her on the expansive front porch. They exchanged morning pleasantries as Violet led the way into her home. It was full of antique furnishings dating back 150 years or more, but Michele immediately noticed the aged appearance of the walls. Michele knew Amber from school up at Auburn University. She had a reputation for quality work, so this made even less sense. She made a mental note to contact Amber and ask her about it. As the women continued to tour the home, it became obvious that every room was affected in the same way—dull, dingy, almost dirty-looking walls and floors. Violet said she was living here, but despite all the furnishings it just didn’t have a lived-in feel to it. Once on the third and top floor, looking out onto the backyard, an outbuilding was visible. “What’s in there?” Michele asked. “Nothing of any consequence.” Violet’s mood darkened. Michele ignored it and pressed on. “I wouldn’t know anything about that,” she snapped. Violet followed her out anyway, cheerful, her moodiness a distant memory. Michele spent the evening scouring the internet for historically accurate information on interior designs of the antebellum south and information about Stanfield House in particular. She discovered the home was used by Union troops as a headquarters and infirmary after the owners had fled. A common practice during the ‘War Between the States,’ thought Michele. There was more, but she was tired, and the hour was late. She felt she had enough background to get started. Next day she met with her general contractor, James Mosley at Stanfield House. He looked at the job and gave a price to Michele, which she included in her proposal to Violet. James had no idea what was on the walls but felt a coat or two of oil-based primer should take care of it after prepping the surface. For her part, Violet only gave the proposal a cursory glance, almost as though she’d lost interest, but she signed off on it. Later that same week, James and his crew began moving and covering furniture in preparation to paint. James was helping roll up a large Persian carpet in the hall when he noticed something strange. There was a large, dark red stain on the floor and it didn’t look like old paint, more like an old blood stain. He called Michele. “Hey, James. What’s up?” she answered. “The price of the job. That’s what just went up,” James shot back. He explained what they’d found. “What’s weird is, it looks like it dried in place with no attempt to try and clean it up at all. It’s going to be expensive to clean that up. It looks like it’s been there awhile. We may even have to replace the floorboards.” James delivered what he felt was a worst-case scenario. “Do not remove any floorboards! They are original to the house and I’d never be able to come close to matching them. Clean it. I don’t care what it takes,” she said. “You’re the boss.” James returned to the job to try and figure out how to remove the mysterious red stain without damaging the floor. Michele tried to reach Violet to let her know of the setback but only succeeded in hearing a message from her answering service that she’d be out of the country for the remainder of the job. “Stranger and stranger,” mumbled Michele to herself, grateful that she’d figured in a contingency fund for unexpected situations like this. Back on the internet, Michele discovered what the red stain probably was. The story was that a Confederate soldier broke into the house and shot the Union officer on duty in a vain attempt to reclaim the house for the Confederacy. The officer supposedly bled to death right in the hall before help could get to him. “But if there’s any truth to this, why is the stain still there after more than 150 years?” Michele thought. She called James with the information she’d uncovered. “That’s just great. Didn’t know your guys were superstitious.” Michele was frustrated but couldn’t help but remember her initial impressions of the house. “I know the house is in rough shape, but no way is it haunted. You don’t believe that stuff, do you?” she asked. Michele decided it was time to give the previous designer, Amber, a call to get her take on the house. The person Michele knew from college had changed dramatically. The formerly energetic, take-charge Amber seemed depressed, slurring her words and having difficulty stringing words together to form a coherent thought. She screamed in terror when Michele mentioned Stanfield House. “You don’t want to know…not even sure I know. Just get out!” she screamed. “Not worth it. At least promise me you won’t spend a night there. That was my mistake and I barely escaped,” pleaded Amber. “Who owns it now?” she asked. “She’s family. Violet Stanfield.” Michele replied. “The house and that—that woman have secrets!” she yelled. Wow, Michele thought. That was…something. She is one troubled woman. The project progressed uneventfully, even smoothly. Fresh paint brightened the home yet kept it true to its roots. Sunlight streamed through the large windows. As Michele moved through the design and decorating phase of the project, she felt as if she was breathing new life into the house, making it truly a warm and inviting home once again. Pressure mounted as the deadline approached, and Michele decided to pull an all-nighter to finish up. Amber’s dire warnings seemed foolish now. Besides, Michele had never been superstitious, and the job came first. As she finished up, fueled by coffee and enthusiasm, she had some leftover building material that she needed to store. Not wanting to spoil the look of the home at the reveal, she decided to check and see if there might be room for it in the old outbuilding behind the property. She trudged out there and was pleasantly surprised to find the door unlocked. She entered the gloom and put down the load of material she’d carted out there. It was then she noticed the old trunk. There might be something in there I can use in the main house, she thought. The rusty hinges creaked as she opened the trunk. She looked into the gloom. She turned to look and see if there might be other treasures in the old shed. The shed’s door slammed shut. She ran to it, pulling with all her might. No use, it was stuck tight, though only minutes before it had swung open easily. 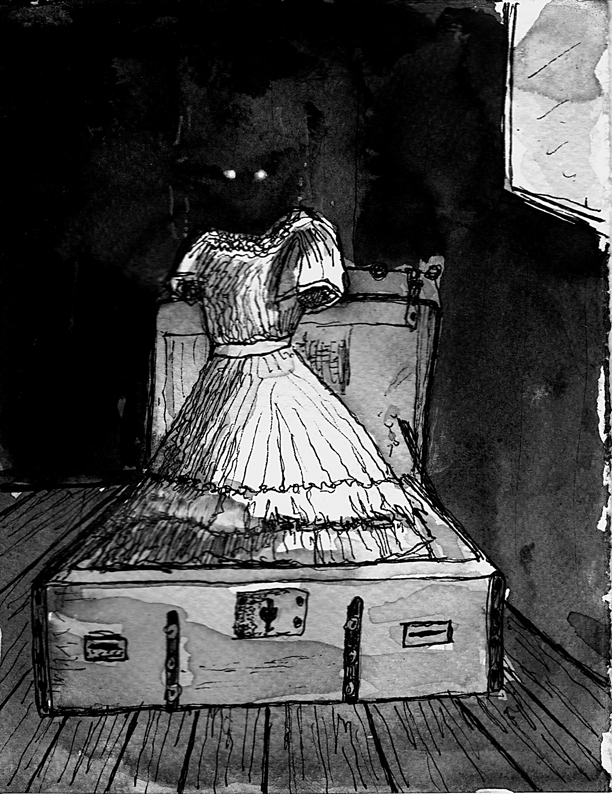 Then she heard…it- The rustling of the moldy, old dress. As she turned towards the sound, she couldn’t believe it. The dress rose from the trunk as if suspended by some invisible wire. -If only that had been the case. An opaque, greenish fog coming from deep inside the trunk rising inside the dress formed a torso and limbs. As the foggy substance solidified, hair began to grow on top of the thing’s head. Eyes rolled up from inside the head and found their proper place with a sickening, wet plop. The ghostly thing seemed familiar somehow. Then it spoke. “I warned you not to be here at night!” it rasped. “I’m not giving up my home to a bunch of Yankee savages! They locked me in that trunk to die. And I have died over and over for more than 150 years now. “No!” Her unearthly scream echoed through the small shed. “Look!” She pointed a gnarled finger at the backyard where Michele had supposed a deck once was. Some foul-smelling goo dripped from the pointed finger. Michele tried not to think what it might be. Slowly a structure revealed itself. Ancient lumber milled for a sinister purpose. Gallows! Five men (or what were men once) shuffled slowly to their execution, prodded forward by the ghostly remains of Union soldiers. “Don’t I? Come with me!” The Violet thing grabbed her, pulling her towards the house. As they approached the rear of the house, the backdoor flew off the hinges, landing with a crash in the yard. They entered the newly restored house to find the same filth that had greeted Michele on her first day. All her work gone in a hellish instant! The once beautiful home was decaying in front of her. The walls began to ooze a liquid stench. A Union officer lay bleeding to death in the hall where Violet’s Johnny had shot him so many decades ago. Meanwhile, Johnny was paying his annual penance on the nearby gallows. Crown molding began to splinter and fall to the floor. Flames licked out from the fireplaces where no fire had been burning seconds ago. The roaring flames reached the ceiling, threatening to consume everything- A fire from hell. The Union officer was now gone—his part in this circus of the damned complete until the following year. Violet pulled Michele to the large bloodstain in the hall. The floor beneath the blood seemed to take on the consistency of quicksand. Michele could feel herself sinking lower and lower into the bottomless dark red filth. The last thing she saw was the Violet-creature’s burning eyes glaring above her. The shop door opens. A potential customer walks in with a handful of paint samples. Don and Vicky were your average couple going on an average outing in the jungles of…somewhere. They were on an expedition to find lost treasure and artifacts of…someone. It’s too bad that they awoke a mad god. It gets even worse for the bad guys standing in their way.